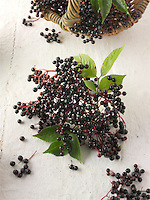 Pictures of fresh picked Elderberry or Elder berry food photos. 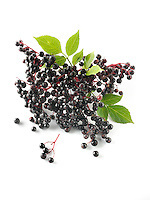 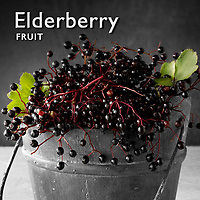 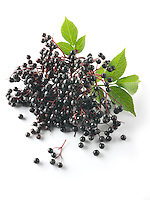 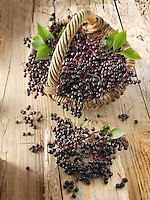 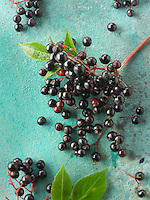 Elderberries are said to increase immunity, fight colds, flu, and sore throats. 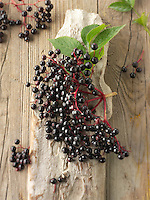 They they are a rich source of bioflavonoids and antioxidants as well as the nutrients potassium, beta carotene, calcium, phosphorus and vitamin C.
Elderberries can be made into jam or made into a syrup which can be added to recipes until the next harvest. 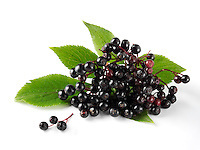 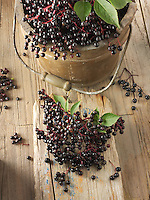 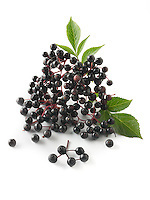 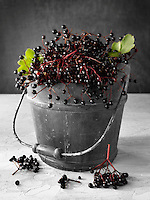 Elderberry syrup is delicious in jellies and can be added to white wine or Prosecco. 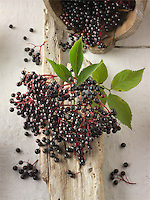 Traditionally elderberries were made into wine. 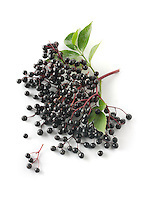 Elderberries have a short shelf life so need to be cooked soon after picking. 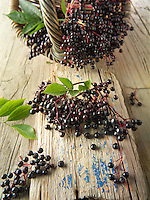 Buy as high resolution stock royalty free pictures of Elderberries to download on line or buy as photo art prints.